the Big World Blog: What is and when is 12th Night? What is and when is 12th Night? 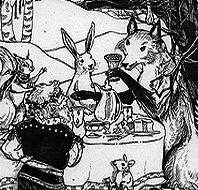 In medieval and Tudor England, the Twelfth Night marked the end of a winter festival that started on All Hallows Eve - now more commonly known as Halloween. The Lord of Misrule symbolizes the world turning upside down. On this day the King and all those who were high would become the peasants and vice versa. At the beginning of the Twelfth Night festival, a cake that contained a bean was eaten. The person who found the bean would rule the feast. Midnight signalled the end of his rule and the world would return to normal. The common theme was that the normal order of things was reversed. 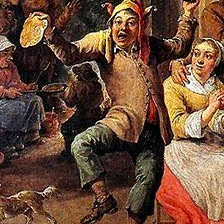 This Lord of Misrule tradition dates back to pre-Christian European festivals such as the Celtic festival of Samhain and the Ancient Roman festival of Saturnalia. Food and drink are the centre of the celebrations in modern times, and all of the most traditional ones go back many centuries. The punch called wassail is consumed especially on Twelfth Night, but throughout Christmas time, especially in the UK. Around the world, special pastries, such as the tortell and king cake are baked on Twelfth Night, and eaten the following day for the Feast of the Epiphany celebrations. 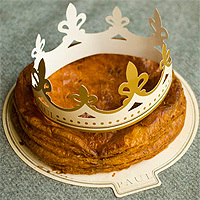 In English and French custom, the Twelfth-cake was baked to contain a bean and a pea, so that those who received the slices containing them should be designated king and queen of the night's festivities. In colonial America, a Christmas wreath was always left up on the front door of each home, and when taken down at the end of the Twelve Days of Christmas, any edible portions would be consumed with the other foods of the feast. The same held true in the 19th-20th centuries with fruits adorning Christmas trees. Fresh fruits were hard to come by, and were therefore considered fine and proper gifts and decorations for the tree, wreaths, and home. Again, the tree would be taken down on Twelfth Night, and such fruits, along with nuts and other local produce used, would then be consumed. In the eastern Alps, a tradition called Perchtenlaufen exists. Two to three hundred masked young men rush about the streets with whips and bells driving out evil spirits. 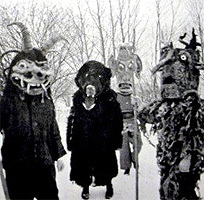 In Nuremberg until 1616, children frightened spirits away by running through the streets and knocking loudly at doors. In some countries, and in the Catholic religion worldwide, the Twelfth Night and Epiphany marks the start of the Carnival season, which lasts through Mardi Gras Day. Modern American Carnival traditions shine most brightly in New Orleans, where friends gather for weekly King Cake parties. Whoever gets the slice with the "king", usually in the form of a miniature baby doll (symbolic of the Christ Child, "Christ the King"), hosts next week's party.. In parts of Kent, there is a tradition that an edible decoration would be the last part of Christmas to be removed in the Twelfth Night and shared amongst the family. The Twelfth Night of Christmas is always on the evening of 5 January, but the Twelfth Day can either precede or follow the Twelfth Night according to which Christian tradition is followed. Twelfth Night is followed by the Feast of the Epiphany on 6 January. 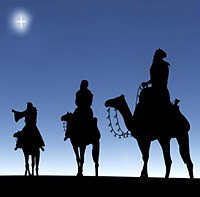 In some traditions, the first day of Epiphany (6 January) and the twelfth day of Christmas overlap. In relation to the suns tracking from shortest day to to the 6th of Jan the 5th night and 6th day mark the point at which both the sunrise is earlier and the sunset is later for the first time in the Northern hemisphere this year and marks the transition from winter to spring. Interestingly the older 12th night was the 17th Jan. The sunrise is noted from around this date to be a minute or more earlier every day. This was also the older date for Wassail.